We’d love your help. Let us know what’s wrong with this preview of Nox by Randi Cooley Wilson. What if rewriting your destiny means that you must sacrifice the one you love? Love has revived an ancient war. Jealousy has risen and torn lives apart. And one prophecy demands the ultimate sacrifice. Serena St. Michael has forsaken her future—for him. Tristan Gallagher has What if rewriting your destiny means that you must sacrifice the one you love? Love has revived an ancient war. Jealousy has risen and torn lives apart. And one prophecy demands the ultimate sacrifice. Serena St. Michael has forsaken her future—for him. Tristan Gallagher has renounced the throne—for her. The Vergina Sun prophecy has been fulfilled, but at what cost? Their love has renewed an ancient war. With Serena gone, will Tristan save her in time? Or will the dark army of Diablo Fairies descend upon the Royal Protector Academy, destroying the London clan’s legacy and ending the existence of the gargoyle race forever? To ask other readers questions about Nox, please sign up. Yes I want the answer to this too! Will be there be an other book? The epilogue kinda brings us into what could possibly be another book series about Serena and Tristan's' child but doesn't end with saying it would be. I am wondering if anyone knows whether or not there is gonna be another series, about this family? Don't get me wrong, I have really enjoyed this series and I really wanted to love this book, but for me it just fell flat. Tristan and Serena's need to protect one another became tedious at some point for me, and I struggled to finish the book. As frustrated as I was with the ending, it also lead me to believe that there will either be a next book in the series or a spin-off. I'll be interested to see what is next for this gargoyle clan. Fantastic end to the series. This definitely was even better than the original series. I loved Serena & Tristan & all the twists & turns of this last book. So that epilogue; is there going to be another spin off? Excellent conclusion to Tristan and Serena's story. I'm now tempted to re-read the Revelation series for more gargoyle antics. Epic love story between Tristian and Serena. Lots of action, drama and funny moments. I would love to see a tv series made about the Gargoyle's Royal Clan. No, that’s not all I will tell you about Nox by Randi Cooley Wilson. But I also have no plans to give anything away, so I will do my best to share the vibes of the story – without the details. Wilson’s Royal Protectors have enthralled us since the first boo Well, it’s over. Wilson’s Royal Protectors have enthralled us since the first book in the original series – Revelation. As this spinoff series about the children of those first works, we find that real love can be tested, but it cannot be destroyed. The bonds of family, faith and forgiveness can delineate us, but they can also unite us. Will things work out for Tristan and his gargoyle princess, Serena? Will they get the happily ever after that we all think they deserve? Or will they, in an effort to protect one another, destroy one another? That’s the thing about love, isn’t it? The very thing that sustains us can just as easily kill us. This final story brings together not only the Royal Protector Academy crew but also the London clan, helping us to say goodbye to a beloved series with an epic finale. Wilson sweeps us into the story from the first words on Page 1. We are forced to become an unwilling (or willing?) bystander to the emotional devastation of loss and emptiness. Tristan’s pain is palpable, his anger tangible. Likewise, Serena makes choices in an effort to protect him that can ultimately doom him. By giving into the storyline, we are swept across imaginative realms and into the darkest corners of our hearts where we let evil win every day. Wilson ensures you need for Xanax and wine with every twist and turn of the story as alliances are tested, new bonds formed and Callan makes cookies… lots of them. But love is the ultimate – worth every sorrow and sacrifice. As for how it ends, I was both surprised and pleased. The final chapter closes with a satisfying thud – a little broken and battered but better for it. I received this eARC from Red Coat Publishing and the author. This is my honest review. I am going straight into my thoughts without doing a synopsis overview. Serena and Tristan are two of the most stubborn characters I've ever met, and I have definitely had my fair share of stubborn characters. I wanted to strangle them both because they just won't communicate with one another! Seriously, if they would have just talked to each other about what they were planning, life would have been so much b I received this eARC from Red Coat Publishing and the author. This is my honest review. Serena and Tristan are two of the most stubborn characters I've ever met, and I have definitely had my fair share of stubborn characters. I wanted to strangle them both because they just won't communicate with one another! Seriously, if they would have just talked to each other about what they were planning, life would have been so much better and this book wouldn't have taken so much time going around in circles. But that doesn't mean I hated the book. In fact, I LOVED it! It could have done without so much drama, but then how would that have been any fun, right? Both Serena and Tristan had their hearts in the right place, and they both had excellent plans. But because they weren't cluing the other one of their ideas, they kept screwing everything up. The back story about the side characters got a bit convoluted, but I was able to figure it all out to make the story flow better and understand what was happening. Overall, I really love this series, I love the characters, and I loved the ending. I can't wait to see how the next part goes, cause I'm going to guess that there is more from this author about this world after that ending. For all of those who have read this series - you are going to love this ending. For all of those who haven't read this series - you desperately need to get all three and devour them like I have just done in the past few days. You won't regret it! Once upon a time I started this series on book 2, don’t question me as to why, I quickly remedied that and started at the very beginning of the entire series. When a person is a book reviewer, like I am, I am lucky to be able to get to read books before they are released. The downside to that is trying to gather the thoughts you have when you are reading the book. You try to come up with words that would mean something meaningful about the book. Most people probably think that being a reviewer i Once upon a time I started this series on book 2, don’t question me as to why, I quickly remedied that and started at the very beginning of the entire series. When a person is a book reviewer, like I am, I am lucky to be able to get to read books before they are released. The downside to that is trying to gather the thoughts you have when you are reading the book. You try to come up with words that would mean something meaningful about the book. Most people probably think that being a reviewer is easy. It isn’t at all. When we read books with this caliber of writing it is very difficult to write a review that is worthy of the book. That is why it is hard to write this review. There are no words that would to this book justice. Randi has written a book that will leave you speechless. Your words are replaced with tears and smiles. From the beginning of the series to the very last Words that are on the page, Randi leaves you feeling satisfied. You have no questions left and you have a sense of completeness. The journey of Tristian and Serena over the course of the three RPA books was a beautiful one and Randi could not have done a better job concluding the series than she did with Nox. Each book in the series just kept getting better and better; however, this finale outshined them all. She made us feel all of it! Laughter, pain, intense love, pride, fear as to what was going to happen next, so many emotions rolled into one novel. But the ending! That ending was one of the most beautifully depicted e The journey of Tristian and Serena over the course of the three RPA books was a beautiful one and Randi could not have done a better job concluding the series than she did with Nox. Each book in the series just kept getting better and better; however, this finale outshined them all. She made us feel all of it! Laughter, pain, intense love, pride, fear as to what was going to happen next, so many emotions rolled into one novel. But the ending! That ending was one of the most beautifully depicted endings to a series I have ever read. She just keeps getting better and better. Looking for a series that will get you absolutely hooked within a matter of 2-3 pages? Choose this one. Looking for a series that has you become emotionally tied to the characters and feel a connection to each and everyone of them? Choose this one. Looking for a series that has brilliant writing and will cause you to laugh out loud and then sprout tears the next? Choose this one. I promise you, you will not regret it. Hands down, you cannot go wrong reading anything (I mean ANYTHING) Randi writes. My only concern now is how am I going to read anything else that will compare to this series?! So, love/hate is too strong ... so I think its better to say I have a real like / dislike for this book. I've enjoyed The Royal Protector Academy overall. I liked the characters and world building. I thought this installment was even better than the preceding Revelation series. Its epic, romantic and full of adventure. Yet, I swear as good as Randi Cooley Wilson is at giving us these interesting books she also overdoses on words like "end my existence." I think in Revelation it was "every fiber o So, love/hate is too strong ... so I think its better to say I have a real like / dislike for this book. 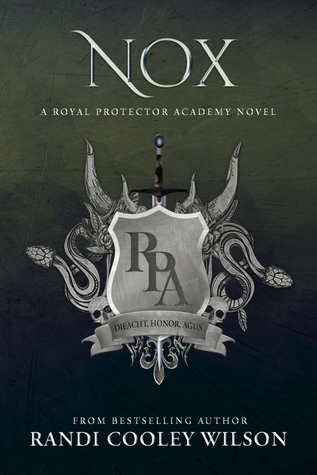 I've enjoyed The Royal Protector Academy overall. I liked the characters and world building. I thought this installment was even better than the preceding Revelation series. Its epic, romantic and full of adventure. Yet, I swear as good as Randi Cooley Wilson is at giving us these interesting books she also overdoses on words like "end my existence." I think in Revelation it was "every fiber of my being." I just wanted to roll my eyes after a while because those show up so much. I can appreciate romantic declarations, but goodness give it a break because it loses something after you use it so much. I cannot believe this is the end of the series! I have been a huge fan of this author for years & had the pleasure to finally meet her this last year at Penned Con! "My throat constricts, my lungs seize, and my heart soars because it hits me hard that I love this intelligent, attractive, vulnerable warrior. With everything I am. And I will destroy anyone or anything that tries to hurt her." Nox is the final book in the RPA series for Tristan and Serena's story. The author brought out some ma I cannot believe this is the end of the series! I have been a huge fan of this author for years & had the pleasure to finally meet her this last year at Penned Con! I’m not quite sure I understand how Randi did it. But here we are. At the end of a gargoyle era. And as much as I want to hate her for this story ending, I love her that much more for sharing it with us. This final chapter, in my eyes, was the perfect ending to this series. It felt real and full and balanced. Sarcasm and wit balance drama and struggle. Each character is flawed and beautiful and relatable somehow. Randi, if ever we should meet, I will hug you (if my introverted self can get over t I’m not quite sure I understand how Randi did it. But here we are. At the end of a gargoyle era. And as much as I want to hate her for this story ending, I love her that much more for sharing it with us. This final chapter, in my eyes, was the perfect ending to this series. It felt real and full and balanced. Sarcasm and wit balance drama and struggle. Each character is flawed and beautiful and relatable somehow. I have such a strong connection with each and every one of them. This author has a way of fascinating you with her brilliant mind and captivating stories. Nox had so many gut punching moments, I ran the gamut from tears to laughter and back again. Serena and Tristan may have been fated but it took all of their strength and determination to stay together. I can't wait to see if we get a story on Striker next! What a wonderful read! Randi has done justice to these characters. What a rollercoaster of emotions this book took me through. I cried happy tears, sad tears, had plenty of laughs and hey, yes... the St Michael's are "quirky". This was the perfect ending to Serena and Tristan's story as well as all the St. Michael's one. The story flowed beautifully and it just won't let you stop reading. I've fallen in love with the world Randi has created and be sure they're something you can go back to again an What a wonderful read! Randi has done justice to these characters. What a rollercoaster of emotions this book took me through. I cried happy tears, sad tears, had plenty of laughs and hey, yes... the St Michael's are "quirky". I've fallen in love with the world Randi has created and be sure they're something you can go back to again and again. This book just like the whole RPA series was a real blast. I love all the witty banter between characters. Some of the stuff these characters get up to and say will have you laughing. Also at times your heart will be ripped out. You feel so desperate for things to work out for them. The romance is heart warming and steamy.Randi Cooley Wilson is a genius. She has a great way of describing her worlds so well you can see them come to life in your mind. Although this was a great end I still find myse This book just like the whole RPA series was a real blast. I love all the witty banter between characters. Some of the stuff these characters get up to and say will have you laughing. Also at times your heart will be ripped out. You feel so desperate for things to work out for them. The end of RPA! I loved how this entire series was written. It was awesome getting a few parts from all the St. Michael's clan. How fierce Tristan's love for Serena is and how the both of them go back to back to save one another. Zander was the best. He brought such humor to the story. Every part with Gage in it I was wanting more. I cant wait for his story to come unfolded. I am sad to see the end of the St. Micahels. There was a part where we all ugly cried it was that good. Wow! What an epic conclusion to this incredible series! I am a HUGE fan of Randi’s writing and her books and she definitely does not disappoint. If possible, I fell more in love with the characters...they made me laugh, made me cry and want to throw my kindle across the room. You will definitely devour this book as I did and will not be sorry you decided to read the series. The only downside is that it is all over. I look forward to what is next! Wow!! What an amazing finale to this fantastic series. I really did not want this series to end, and hope there’s plans to continue with the newly introduced striker at the end of NOX! I honestly think I could read about these characters forever. The forever “die for you” kind of love the main characters share is in a word EPIC! The writing is flawless and makes it so easy to follow the genius story line! This is a definite must read for all! Randi did it again! Loved every moment of it and as usual Randi does not disappoint. The story line has a good movement and keeps you glued tho the screen, the conclusion of the RPA come with a punch and makes you second guess about the finale but what a finale it was. I will miss the Gargoyles, Callan specially!! Damn Gargoyles to make me fall in love with you! Can’t believe I forgot about this series! Only ready the first book when it first came out and the other weren’t out yet. Lots of suspense and hotness. Love Tristan and Salena. Seriously the Thor part with Calen was hysterical. The ending was an amazing HEA which I always love. And I had no clue there was another spin off. Whoot! Of course, Nox, does not disappoint!! Randi Cooley Wilson is a phenomenal writer and engrossed you in a story and it’s characters. Tristan and Serena were amazing separate, but even more so together. It was also awesome to get to have so much of the whole St. Michael clan (especially my favorite, Asher). An awesome trilogy that will leave you with a smile!! What an amazing ending to the Royal Protection Academy series! Nox has it all! I can’t even believe that the story ends here! I need more gargoyle protectors! I’m just about ready for Stryker’s story! The ending to Tristan and Serena’s story will forever be of the epic kind! A beautiful way to end the RPA series. I have never wanted a series NOT to end as much as I did reading NOX. I loved it!! Zander and Callan are hilarious. They need to have a book all of their own. Tristan and Serena fight for what they want. Protect what is theirs. At any cost. I will miss reading more of the gargoyle world Randi has written, but look forward to her other future books. Randi Cooley Wilson is an award-nominated, bestselling author of The Revelation Series, The Royal Protector Academy Novels, The Dark Soul Trilogy and the upcoming Knightress Series. Randi's books have been featured on Good Morning America, British Glamour Magazine, USA Today's HEA Section, and in the Emmy's Gifting Suite. Her books range in genre, and include contemporary romance, urban fantasy, a Randi Cooley Wilson is an award-nominated, bestselling author of The Revelation Series, The Royal Protector Academy Novels, The Dark Soul Trilogy and the upcoming Knightress Series. Randi's books have been featured on Good Morning America, British Glamour Magazine, USA Today's HEA Section, and in the Emmy's Gifting Suite. Her books range in genre, and include contemporary romance, urban fantasy, and paranormal romance, for both young adult and new adult readers. For more on Randi, please visit her website, www.randicooleywilson.com.